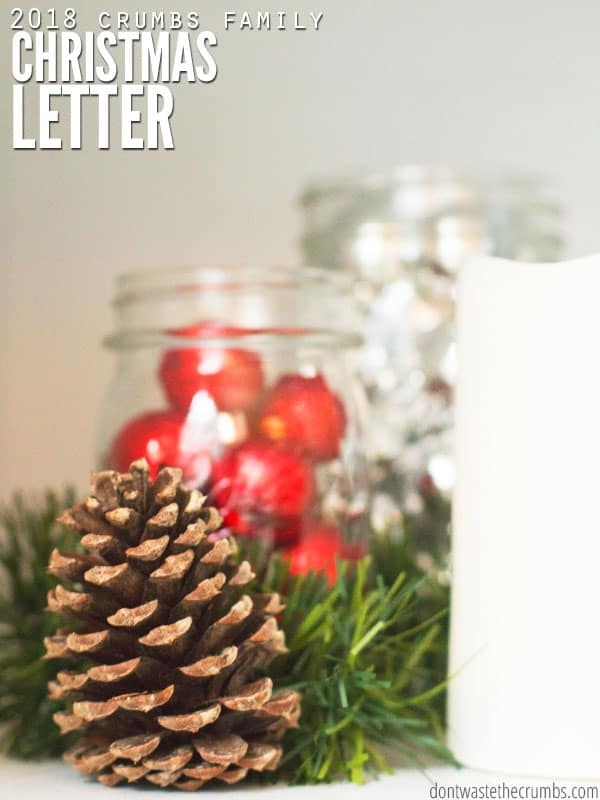 Every year I like to write a Christmas letter to you, my readers. It’s a fun opportunity for me to share with you what’s going on in our lives behind the recipes and grocery shopping tips. Granted, I DO like those things, but just like you, there’s so much more going on in our lives too! So let’s get to it! At the end of each year, I like to look back at the year as a whole, figure out how it fits into God’s big plans for us, and summarize the year in one word. Of course I never know for sure, but it’s fun to guess and see how each year fits into the others at just the right time. 2015 was a year of transition, 2016 was a year of moving, and 2017 was a year of norming (let’s pretend that’s a word, mkay?). Looking back, I’d say that 2018 was a year of settling. We’ve stopped moving. We know what’s normal for us in this season and there aren’t any huge changes on the horizon (THANK GOODNESS!). We’re taking advantage of this and we’ve started exploring! We took our first camping trip since moving to Georgia and visited Savannah on the East coast. It’s such a cute town, and you guys were right – Leopold’s ice cream is SPOT ON! 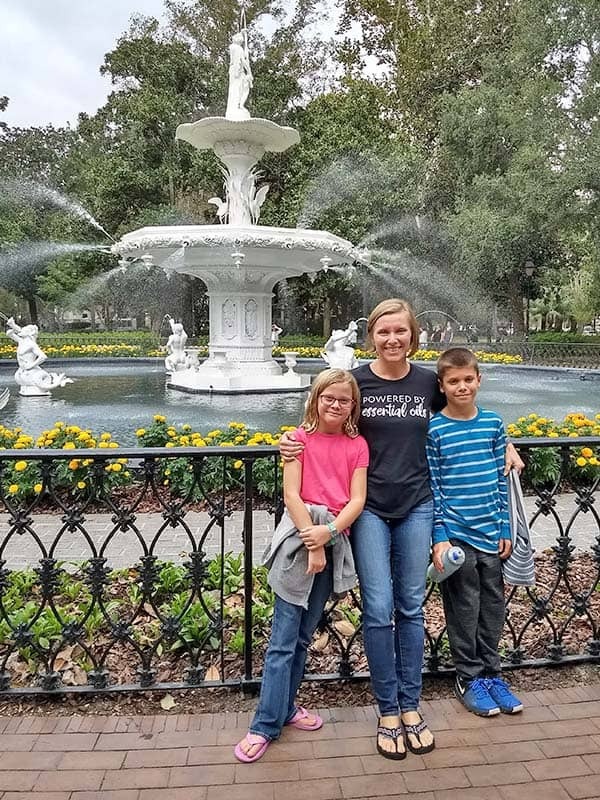 We’ve actually put a lot of miles on the car this year in addition to Savannah… visiting my good friend Stacy in Virginia, surprising the kids with a cruise out of Miami (we found last minute tickets – literally 4 days before porting – for 50% off! ), a separate trip for just Mr. Crumbs and I to Orlando, a couple day trips to Chattanooga, and visiting family in Greenville. 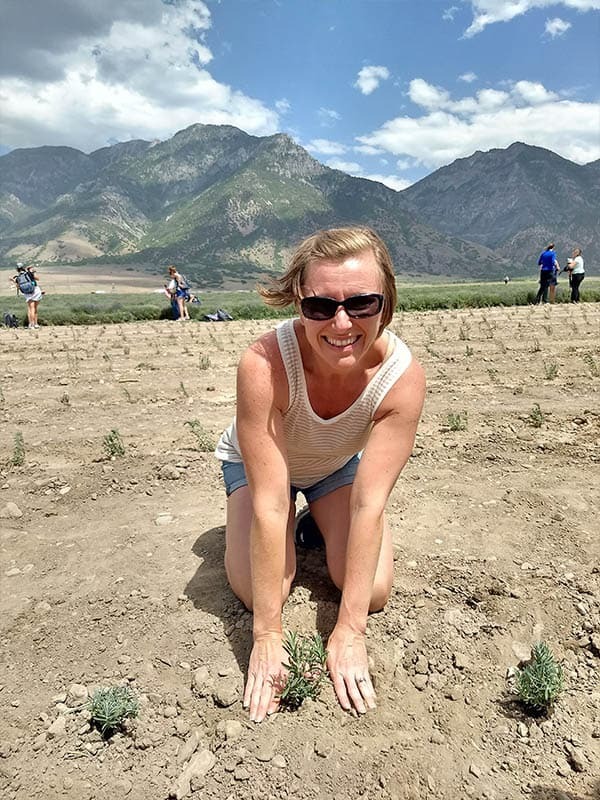 I was also able spend a few days in Chattanooga, recharging and planning 2019, as well as going to Young Living’s Grand Convention in Salt Lake City, Utah. 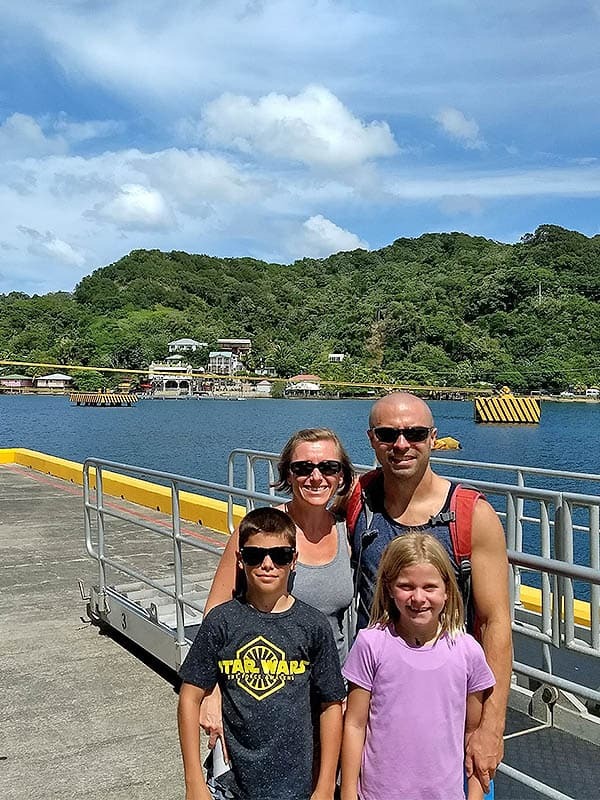 In addition to our own trips, our house has become the ‘stop-over’ for many of our friends who are en route to someplace else and we absolutely love it! Staying up late with my friend Erin and her family and having Easter dinner with Katie and her family are a treasure to me because I first met these ladies (and Stacy!) online. But over the years, our friendships have grown to real-life and it’s such a blessing! It’s even more fun to watch the kids hang out together, because they’re all within 1-2 years of each other! We were also blessed with several visits from family members, Nana, MeMe and PopPop, my crunchy sister-in-law and her family – they all took turns breaking in the guest bed. Spending the summer at the pool is one of our favorite things to do, and this year was no exception. We actually love the pool so much, that I even make our meal plans based on whether or not we’re packing and taking dinner to the pool. Turns out, just about anything can be packed and eaten someplace else! When we weren’t at the pool, we were at either Six Flags or White Water. We gifted the kids season passes to the parks last Christmas, so we made sure to make the most of it! The Boy has ridden every ride he’s tall enough for in the park, which is a huge deal considering last year he wanted nothing to do with them! The Girl was apprehensive at the water park, but her and went together right when they opened and rode as much as we could when there weren’t any lines. I think the chance to overcome her fears – without anyone around – made going to the park much more fun. Making friends isn’t easy, but some of our favorite memories in California are with our friends (yes, I’m talking to you Chaty! ), so now that we’re settled in our own home, we’ve been more intentional about it this year with hosting game nights at our house. Sometimes we make pizza, sometimes everyone brings a dish, and sometimes we just do desserts – we have fun every time though and our game collection has grown significantly. The kids are getting older and bigger, as much as I beg them to stop growing. Does anyone have a fix for that? Anyway, both kids are thriving. They did Fit Kidz over the summer (similar to CrossFit, but for kids), spent two weeks with their grandparents over the summer, and getting settled at the new school they started in the fall. The Boy (11 years old) finished his second year of league basketball this past winter and they went the whole season undefeated! He’s not the biggest kid on the team, but he’s scrappy and makes it his job to not let the other team get a clear shot. Yes, I sure am that proud mama in the stands yelling at her boy to “get him!” at the top of her lungs! He also started his third year a few weeks ago and our Saturdays are now booked through the end of January, FYI. He’s officially a tween (?!) and in middle school (?! 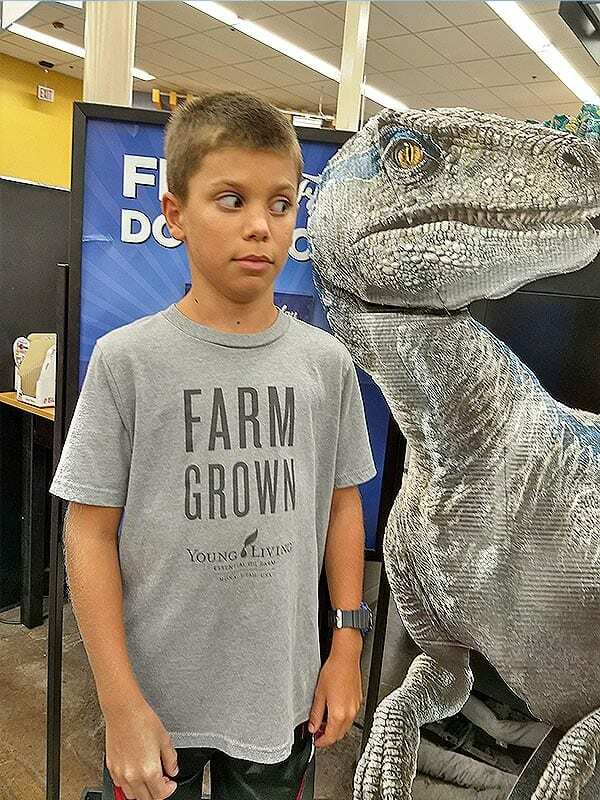 ), still loves LEGOs, plays percussion in the school band, has developed a recent fascination for pens and wants to be a storm chaser when he grows up. He actually said I could go with him to chase tornadoes. I told him I’d think about it. The Girl (9 years old) loves to craft and is known to leave little notes of encouragement throughout the house. It’s not out of the ordinary to find a sticky note on my bathroom mirror, and just last night she wrote a note, folded it up small and tied a ribbon around it. MeMe (my mother-in-law) taught her how to curl ribbon with scissors and she’s ALL about that. She started chorus this fall at the new school and she LOVES it! We got to see her perform twice this season, and it’s pure joy hearing her sing in the car or around the house when she thinks no one can hear her. 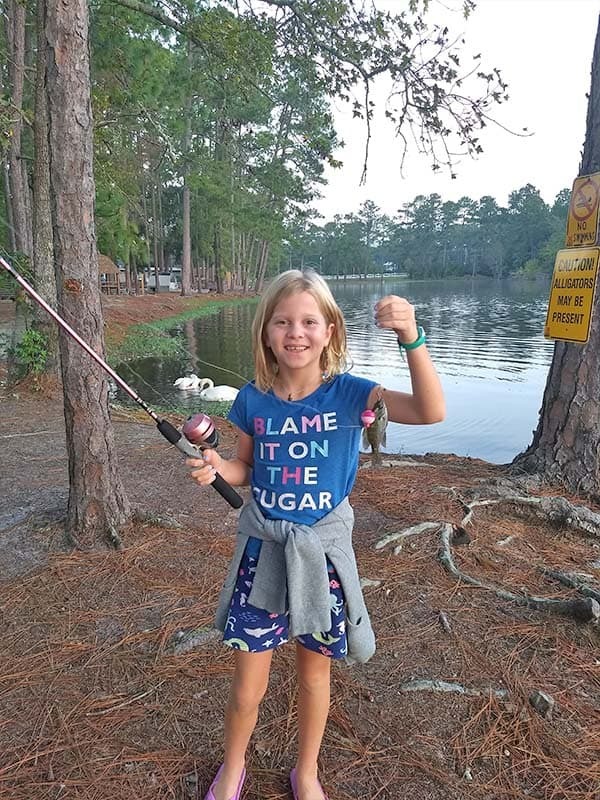 She also caught the most fish in Savannah – her first time fishing! She hasn’t found “her thing” yet, but that just means more opportunities for experimenting. We tried gymnastics this past year, and it was fun for a season. She wants to try dance in the New Year – something between hip hop and ballet. We’ll see how that goes! Mr. Crumbs and I, like the kids, are branching out and finding our new normal. He meets with a couple guys from church Friday mornings and that time has become one of his favorite hours of the week. He’s also found a local bike riding club, is teaching The Boy how to mow the lawn, and dusted off his tools to build a shelf for the laundry room, a nightstand for The Boy, and he turned a side table into a stool for The Girl. I stepped down from serving with the little kids and volunteered to be a leader at Youth Group this year, now that my son is in middle school and I’m that over-protective-not-helicopter parent who simply wants to know who her kids’ friends are. Every Wednesday The Boy and I head out while The Girl and Mr. Crumbs try to stay out of trouble. Which usually involves making cookies. 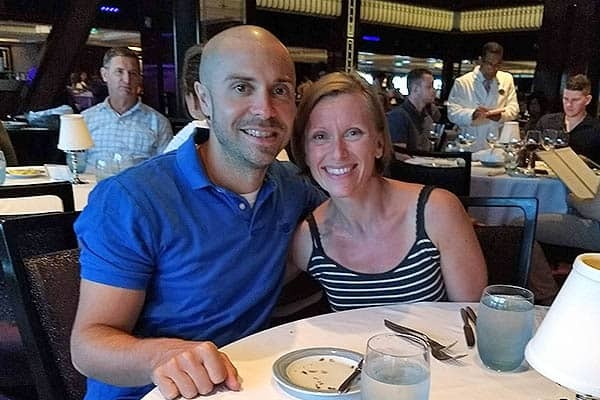 It’s been six years since I officially started this blog and the fact that God used – and continues to use – one of our lowest moments in our marriage to serve and help others never ceases to amaze me. I truly feel like this is a community, separated merely by screen and miles. When I share my struggles and wins you’re right there with me, encouraging me and cheering me on. I get a big goofy grin on my face when I think of what’s to come for next year, and I can’t wait to see how God will use these ideas to change lives. Thank you for reading, and thank you for letting me serve you. Super Quick Hearty Stuffed Bell Pepper Soup for Clean Eats!